With the Lok Sabha elections 2019 fast approaching, a rise in interest for political news and personalities has been palpable among people. How do we gauge the popularity of a political party or politician? Does Narendra Modi continue to be more popular than Rahul Gandhi among India’s tech-savvy citizens? Or have there been any obvious or surprising changes in interest patterns? Any one digital tool or method may not be sufficient to gauge the overall popularity of a person or party, but Google Trends does give some indications of the interest a person or issue or party has been able to generate in the online world within set timeframes. 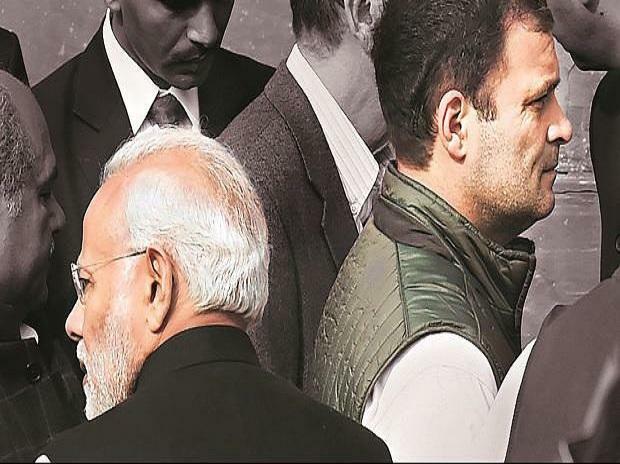 So, we used Google Trends data to see how the two most prominent political rivals of the day — Prime Minister Narendra Modi and Congress President Rahul Gandhi — compare with each other in terms of rousing interest among web-surfing population. Google Trends provides a representative number for 'interest over time' for any particular term. According to Google Trends, “the number represents interest relative to the highest point on the chart for the given region and time. A value of 100 is the peak popularity of the term. A value of 50 means the term is half as popular. A score of 0 means that there was not enough data for this term”. We used different criteria and terms to analyse how the two leaders squared up as far as online interest in India went during full calendar year 2018 as well as over a five year period ending 31 December, 2018. The comparison includes data for India only. When we compare 'Narendra Modi' and 'Rahul Gandhi' as search terms for full calendar year 2018 in web search (using their full names), we find that the term 'Narendra Modi' scores 49 while 'Rahul Gandhi' scores 31. If we look at the trendline, we find that 'Narendra Modi' was consistently ahead of 'Rahul Gandhi' in sparking interest over the entire year, except during a week each in July and December, when 'Rahul Gandhi' was ahead of 'Narendra Modi'. Keeping all the search criteria unchanged for these two terms and changing 'web search' to 'news search', we find that the picture changes a little. 'Rahul Gandhi' scores 46, while 'Narendra Modi' scores 39 over the same period. That seems to imply that the term 'Rahul Gandhi' was more popular than the term 'Narendra Modi' in news searches. 'Modi' appears to have been far ahead of 'Rahul' in web searches during the calendar year 2018. While 'Modi' scored 45, 'Rahul' scored 30. At no point during the year did 'Rahul' cross 'Modi' in terms of interest generated. If we retain 'Modi' and 'Rahul' as search terms, we find that 'Modi' is far ahead of 'Rahul' for calendar year 2018 even in news search. 'Modi' scores 45 (same as web search) while 'Rahul' scores 20 (against 30 in web search). This shows a huge gap between the interest generated by these two terms on the internet over calendar year 2018. The comparisons above are for the calendar year 2018. Now, what if we compared the same terms over a longer period? We tweaked the comparison period to five years (from 1 January 2014 to 31 December 2018) to see how these terms compared over the five-year period. When we see results for these terms over a period of five years (from 1 Jan, 2014 to 31 Dec, 2018), we find that the term 'Narendra Modi' scores 13 on web search, and 'Rahul Gandhi' scores only 4. Looking at the trendline, we find that the gap between the two, fairly wide at the start of this period, has narrowed down consistently since. Interest for both 'Narendra Modi' and 'Rahul Gandhi' was the highest in 2014, when Narendra Modi was sworn in as prime minister. Using the same criteria to see Google Trends result for news searches, we find that the term 'Narendra Modi' scores 14 and again trumps 'Rahul Gandhi' (which scores just 3). As observed in the web search trendline, we find that the two terms come to nearly the same level at the start of the first half of 2017. In web search criteria, 'Modi' has been far ahead, with a score of 14, against a score of 6 for 'Rahul'. The trendline shows that interest in the term 'Rahul' has been consistent in these five years, while that for 'Modi' has been fluctuating (even as it continues to be of more interest consistently). In news search, the term 'Modi' conveniently exceeds 'Rahul' in generating interest online over a five-year period. 'Modi' scores 16, while 'Rahul' scores 6. This gap narrowed in 2018, but 'Modi' still continued to be ahead of 'Rahul’. These are only some ways of slicing and dicing information on Google Trends. There are innumerable permutations and combinations that could be used to analyse these data sets, and each would paint a picture slightly different from the other. If we compared these two leaders' presence on social media using data from Crowd Tangle, we would find that Narendra Modi was far ahead of Rahul Gandhi. On Twitter, the Prime Minister's official account, @PMOIndia had 27.7 million followers while his personal account, @narendramodi had 45.1 million followers. Rahul Gandhi's Twitter account @rahulgandhi had 8.28 million followers. On Facebook, Narendra Modi's verified page had 43.3 million likes while Rahul Gandhi's page had 2.2 million likes. Note to readers: We had carried an earlier report which focused only on news searches with full names to find Rahul Gandhi ahead. The story was withdrawn because it did not present the full picture.